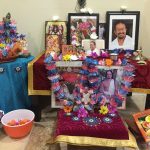 By the Grace and Abundant Love of our Sadguru Maharaj, a grand Akhanda Nama Sankirtan was held in Seattle on August 15th to celebrate Janmashtami. 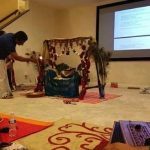 The Sankirtan, hosted by Sangeetha and Prasad at Sammamish, WA, started at noon and went on till 6 pm. 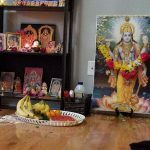 A number of Bhagavatas from our Seattle GOD Satsang group participated to make this event a grand success. The Bala Gopas and Gopis of our Satsang group enjoy the Akhanda Naama festivities by singing, dancing and doing ‘Kolaattam’ around Krishna and our Guru Maharaj. They also enchanted everyone by rendering Krishna Bhajans, some of which were composed by Sri Sri Swamiji Himself – Vasudeva Vasudeva, Jaya Jaya Krishna. 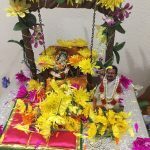 The festivities concluded with Srimad Bhagavatam parayanam and Vishnu Sahasranamam. All the devotees who participated felt blessed and energized from the Akhanda Naama.